— Kinsley Graphic, December 14, 1878. Robert Andrew “Clay” Allison was once asked what he did for a living and he replied “I am a shootist.” It is simply not possible to verify the multiple accounts of his numerous outrageous activities with “news” being what it was at the time and a century intervening. Though many of the tales were highly exaggerated, if even half of them were true, people were right to be afraid of him. Born with a clubfoot, Robert Clay Allison, known as “Clay”, was born September 2, 1840, the fourth of nine children of John and Nancy (Lemmond) Allison. His father, a Presbyterian minister, also worked in the cattle and sheep business, and died when Clay was only five. Clay was said to have been restless from birth and as he grew into manhood, he became feared for his wild mood swings and easy anger. 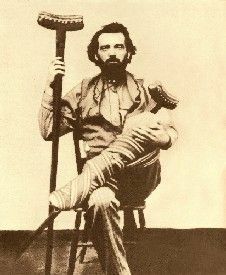 Clay worked on the family farm near Waynesboro, Tennessee until the age of 21 when the Civil War broke out and he immediately signed up to fight for the Confederacy, enlisting in the Tennessee Light Artillery division on October 15, 1861. His clubfoot did not seem to hamper his ability to perform active duty in the Confederate Army, in fact he was eager to fight sometimes threatening to kill his superiors because they would not pursue Union troops when they were running away from the battle. However, just a few short months later on January 15, 1862, he received a medical discharge from the service. His discharge papers described the nameless illness as such: “Emotional or physical excitement produces paroxysmal of a mixed character, partly epileptic and partly maniacal.” The discharge documents further suggested that the condition might have been the result of “a blow received many years ago, producing no doubt a depression of the skull”. That head injury has been the usual explanation for Allison’s psychotic behavior when drinking, perhaps explaining some of his later violent activities. His brother Monroe, also in the Confederate army, was reported in the same year as having deserted. But, on September 22, 1862, Clay reenlisted to the 9th Tennessee Cavalry and remained with them until the war’s end. Apparently, he suffered no further medical complications and became a scout and a spy for General Nathan Bedford Forrest. He began sporting the Vandyke beard he wore the rest of his life in imitation of the flamboyant cavalry commander. On May 4, 1865 Allison surrendered with his company at Gainesville, Alabama. He was held as a prisoner of war until May 10, 1865, having been convicted of spying and sentenced to be shot. But the night before he was to face the firing squad he killed the guard and escaped. Upon his return to civilian life, Allison became a member of the local Ku Klux Klan, whose dislike for the Freedmen’s Bureau of Wayne County nearly led to armed conflict. Allison was involved in several confrontations before he left Tennessee for Texas. It was said that when a corporal with the Union Third Illinois Cavalry arrived at the family farm, intending to seize the contents of the property, Clay retrieved his gun from the closet and calmly killed the Union soldier. Allison, his brothers Monroe and John, sister Mary and her husband, Lewis Coleman moved to the Brazos River Country in Texas. Clay and Coleman never returned to Tennessee. Attempting to cross a wide river on their way to Texas, Zachary Colbert, the ferryman, presented the price of crossing. Clay accused the ferryman of overcharging and an argument ensued, whereby Colbert was left unconscious. It is said that this incident might have led to the ferryman’s desperado nephew, Chunk Colbert, being killed by Allison some nine years later. In the meantime, the Allison rode across the river free of charge. Settling down for a while, Clay learned the ways of ranching and became an excellent cowhand while in Texas. He signed on with Charles Goodnight and Oliver Loving in 1866 and accompanied them on their famous Goodnight-Loving Trail through Texas, New Mexico and Colorado. Around 1867 Clay worked as a trail boss for M.L. Dalton. He then worked for his brother-in-law, Lewis Coleman and Irwin W. Lacy, two cattle ranchers who were also legends in their own time. While in Texas, Allison was said to have had an altercation over the rights of a water hole with a neighbor by the name of Johnson. The two decided to settle the matter by digging a grave and entering the pit with bowie knives. The loser would be buried in the pit and the winner gaining the rights of the waterhole. Allison had excellent skills with a bowie knife and obviously didn’t lose, but whether or not he killed his neighbor is unknown. In 1870 Coleman and Lacy moved to a spread in Colfax County, New Mexico. 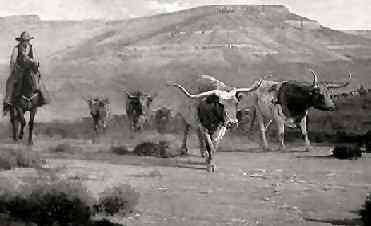 The Allison brothers accompanied them and, as payment for their work driving the herd, they received three hundred head of cattle. Clay took his share and homesteaded a ranch at the junction of the Vermejo and Canadian rivers, nine miles north of today’s Springer. The two rivers ensured ample water and Allison built his ranch into a profitable business. The Allison brothers quickly entered the “social scene in Cimarron and Elizabethtown and within only a few weeks the cowboys and ranchers were calling Clay a friend. But law had not yet come to these early settlements and the cowboys‘‘ Saturday night visits to town would find them drinking hard, pulling out their six-shooters, and riding up and down the streets yelling and shooting. They made their rounds to the local saloons and gambling halls where they shot out lamps, lanterns, mirrors, glasses and were said to have particularly enjoyed making newcomers “dance” as shots were fired at their feet. On April 30, 1871, Allison and two others were said to have stolen 12 government mules belonging to the Fort Union Commander, General Gordon Granger. In the fall, he tried the same stunt again, but when military men came running to the corral, Allison accidentally shot himself in the foot during the confusion. The would-be rustlers escaped to a hideout along the Red River, where Allison sent his friend Davy Crockett (a nephew of the American frontiersman) to fetch Dr. Longwell from Cimarron. Though Clay was treated, he spent the rest of his life with a permanent limp. After recuperating, Clay was on a drinking spree in a local saloon, when suddenly he took a dislike to a man named Wilson. Wilson had the good sense to quickly depart, but left Clay in a foul mood. Clay then happened into the County Clerk’s office where he took offence to something that John Lee, the county clerk said and slung a knife at him, stapling his sleeve to the timber of a door. Lee broke free and ran across the street to Dr. Longwell’s office. Next, Clay repeated his knife act with a young lawyer, Melvin W. Mills, who also fled to the doctor’s office. Mills described what had happened to the doctor and took up his gun, stating that he would have to kill Allison in self-defense. While the doctor was trying to persuade the lawyer away from such a dangerous act, he noticed that Allison was riding toward the office, at which time the clerk and lawyer promptly fled out of the back door. The doctor stepped out of his office to meet Allison, telling Clay that he had been acting badly. The rancher only laughed, stating that he had nothing against Mills or Lee but wanted Wilson’s ear, then rode off in a vain search for Wilson. 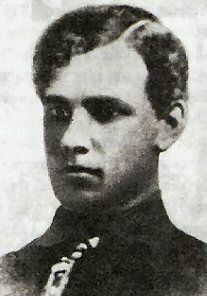 Mills would carry a grudge against Allison for years, which was later evidenced in the Colfax County War.